The ISOW784x is a family of high-performance, quad-channel reinforced digitalisolators with an integratedhigh-efficiency power converter. 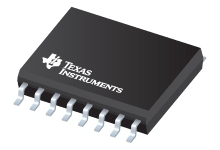 The integrated DC-DC converter provides up to 650 mW of isolatedpower at high efficiency and can be configured for various input and output voltage configurations.Therefore these devices eliminate the need for a separate isolated power supply in space-constrained isolateddesigns. The ISOW784x family of devices provides high electromagnetic immunity and low emissionswhile isolating CMOS or LVCMOS digital I/Os. The signal-isolation channel has a logic input andoutput buffer separated by a double capacitive silicon dioxide (SiO2)insulation barrier, whereas, power isolation uses on-chip transformers separated by thin filmpolymer as insulating material. Various configurations of forward andreverse channels are available. If the input signal is lost, the defaultoutput is high for the ISOW784x devices without the F suffix and low for thedevices with the F suffix (seeVSI and VSO can be either VCC or VISO depending on the channel direction). These devices help prevent noise currents on data buses, such as RS-485, RS-232, and CAN, or othercircuits from entering the local ground and interfering with or damaging sensitive circuitry.Through innovative chip design and layout techniques, electromagnetic compatibility of the devicehas been significantly enhanced to ease system-level ESD, EFT, surge and emissions compliance. Thehigh-efficiency of the power converter allows operation at a higher ambient temperature. The deviceis available in a 16-pin SOIC wide-body (SOIC-WB) DWE package.